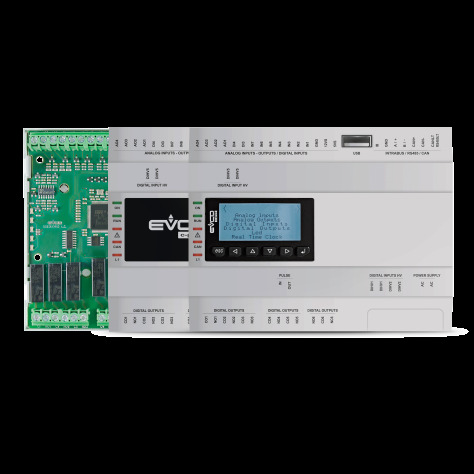 c-pro 3 OEM is a range of programmable controllers in 8-DIN modules, open-board or with housing (blind or with built-in LCD display). It has numerous inputs and outputs (up to 21) and an enhanced memory capacity to meet the management needs of the HVAC/R sector and OEM companies in particular. The INTRABUS protocol enables a low-cost remote LED user interface (VLED Intrabus) to be used for point-to-point applications. The CAN protocol makes it possible to increase the number of c-pro 3 OEM inputs/outputs by adding an expansion and to be integrated with the entire range of c-pro 3 controllers and displays. The MODBUS RTU option, used with an external interface, is always available in both master and slave modes. Those models supplied with the RS-485 enable two MODBUS protocols to be used at the same time. The application software can be designed in a simple, intuitive and portable way thanks to the UNI-PRO 3 integrated development environment. The USB port, supplied as standard, makes the controller easy to program in the development phase and in debugging and it can be updated using the most common USB flash drives. (1) Becomes a RS-485 MODBUS master/slave if connected to the EVIF22ISX serial interface.